Carotid endarterectomy is undertaken to prevent ischaemic stroke. The procedure involves an incision along the medial aspect of the sternocleidomastoid muscle, dissection through the platysma, and then along the border of SCM. This reveals the internal jugular vein and carotid artery lying underneath. The common carotid, internal, and external arteries are slung carefully so as to avoid sending any emboli to the brain. Following clamping of the internal then common then external carotid arteries, a decision regarding shunting will need to be made, depending on collateral circulation to the brain. 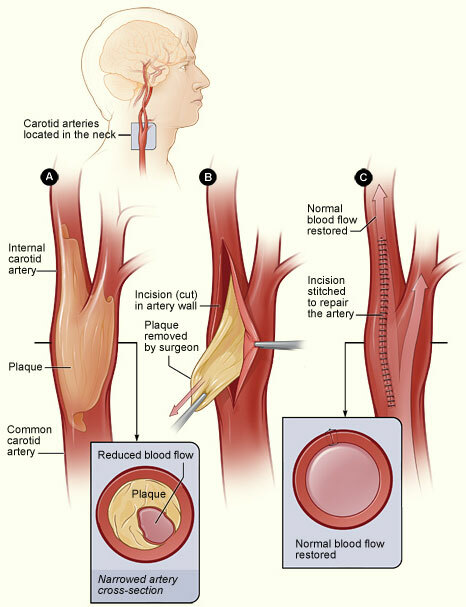 A standard endarterectomy whereby the artery is dissected, slung, and clamped where the artery becomes healthy again, with the artery opened longitudinally and the atherosclerotic plaque excised from the arterial media, and closed with bovine patching. Closure of the platysma and skin is undertaken following haemostasis. Haemorrhage This can occur due to damage to either the artery or vein, and may require blood transfusion, although this is very rare in carotid endarterectomy. Injury to surrounding structures Nerves in the region (vagus, glossopharyngeal, hypoglossal, mandibular branch of facial, and pre-auricular) can all be damaged. These cause swallowing and speech problems, tongue deviation, drooping corner of mouth, and numb patch of skin around the ear respectively. When nearing the carotid artery use bipolar diathermy only. Pain The patient will most likely be given a local anaesthetic to minimise pain. Bleeding There is a small chance of bleeding and bruising in the wounds post-surgery. In the neck, this may require emergency decompression to save the airway hence is a severe complication if it develops. Scarring Wounds in the neck generally heal very well, however there will be a scar which can form a keloid scar, particular in high risk ethnicities. Stroke There is an approximately 2% risk of causing a stroke during the procedure, however this risk is less than the lifelong risk of further stroke in patients undergoing this procedure. Reintervention The reintervention rate for carotid endarterectomy is extremely low.